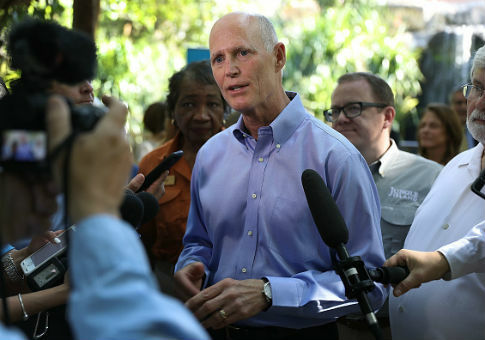 Judges ruled in favor of Florida Gov. Rick Scott's (R.) Senate campaign on Friday, ordering the Broward County elections supervisor to turn over voter information by Friday evening and the Palm Beach supervisor to turn over absentee ballots. The judge in Broward County found election officials violated Florida's constitution by not following open records laws, according to a local NBC affiliate. Scott, who holds a 15,000-vote lead over incumbent Sen. Bill Nelson (D.) in Florida's Senate race, has accused South Florida election officials of trying to "steal" the election for Democrats. The rulings are a victory for Scott's campaign, as Republicans filed a lawsuit against Palm Beach County and Broward County, accusing their elections supervisors of not being transparent about votes still being counted. Nelson's campaign has said it is preparing for a recount. Democratic gubernatorial candidate Andrew Gillum's campaign has also said it is readying for a recount. Gillum trails Republican Ron DeSantis by 36,000 votes. On Thursday, Scott ordered the Florida Department of Law Enforcement to investigate elections offices in Palm Beach and Broward counties. The department found no allegations of fraud. Broward supervisor of elections Brenda Snipes claimed to not know how many ballots still need to be counted, appearing to blame delays on the ballot's length. Protesters stood outside the Broward election office on Friday afternoon, chanting "Brenda Snipes has got to go." Palm Beach's supervisor of elections, Susan Bucher, responded to criticism of delays. Florida law requires a recount if the winning candidate's margin is less than 0.5 percent after the first unofficial count is verified. This entry was posted in Politics and tagged 2018 Election, Andrew Gillum, Bill Nelson, Florida, Rick Scott, Ron DeSantis. Bookmark the permalink.